There is no "temporary application" option as there is when trying to join a WebEx meeting in progress. As an alternative, the user sending the recording can download the video, but it's in an ARF or WRF format that can't be played without first installing proprietary software that requires root/administrative access to the full machine. 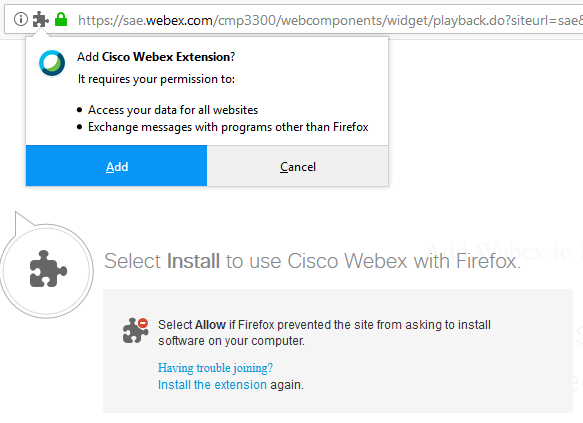 Theoretically, it is not necessary for WebEx to have administrative control in order to play a video, and it could be that this requirement is opening security holes for Cisco et al. to exploit and get information they shouldn't have access to. What is the reasoning behind this requirement? Is it a significant security issue to be concerned about? Have there been independent examinations of the software to verify that the software is not (or is) doing more than it claims to? Browse other questions tagged appsec browser-extensions cisco uac install or ask your own question. Why is it a security issue to load Notepad++ plugins from %APPDATA% folder?